Iron Chef Masaharu Morimoto never enters the kitchen stadium without his custom made Japanese knives retailed at $4000 and $5000 each. In fact, he has a collection of 80 knives. Even master chef and TV icon Julia Child had apparently 60 knives in her collection. Unless you are pro or a foodie that seeks the very best, then you don’t need to worry about spending thousands of dollars. For most, three knives are all you need. Forget about those knife blocks and forget about how they will look in the corner of your kitchen. Do you really want to spend hundreds or even thousand’s of dollars on some knives? 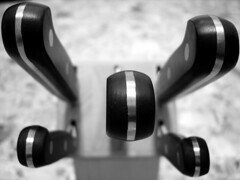 Many manufacturers trap consumers in purchasing a knife block calling it the essential. You will soon realize that most of the time you only use two or three knives. For the everyday home cook, a chef’s knife, serrated knife and paring knife are the basics for cooking. The chef’s knife is really the main knife for all cooks. Best for chopping vegetables, butchering meat and mincing herbs, the chef’s knife handles over 90% of the cutting required to prepare a meal. An 8-to-10-inch chef’s knife is recommended. What do I Like? Personally, I enjoy using the 8-inch chef knife for its weight and ability to maneuver quickly making the cutting easy and smooth. The serrated knife is one of the most efficient ways of slicing. Normally, we think of slicing through bread, but really its one of the best ways of slicing through tomatoes, citrus fruits, quiches and pies. An 8-to-10-inch serrated knife is recommended. What do I Like? Although some people prefer using an 8-inch bread knife, I like going with the extra 2-inches. I find shorter bread knifes have a tendency to catch the knife tip on larger bread loaves. This can cause an uneven and messy cut. The paring knife is best for more delicate work that requires precision. It is best used for peeling and coring apples and tomatoes, deveining shrimp and cutting citrus segments. The fine blade also allows clean slicing of soft fruits (i.e. strawberries, plums, blueberries) without damaging the flesh. A 3 ½ -to-5-inch paring knife is recommended. What do I Like? I prefer a 3 ½ inch paring knife. However, a paring knife is more based on preference since the weight and balance are not as important. The main thing you should look for is a comfortable grip with a sharp blade that is slightly flexible in order to handle tight areas. As for any knife whether you spend $25 or $300 a knife, you must keep them sharp. A dull knife is more dangerous than a sharp one. A knife can easily lose its sharpness by making contact with food or a cutting board. By using sharpening steel, knives can be quickly restored. Keep in mind a sharpening steel does not necessarily sharpen a dull knife, but instead it realigns the cutting edge. At some point, a knife should be sharpened by a sharpening stone or electric sharpener. If you are not too familiar with using either of these devices, then the best way is to leave it to the pros at a kitchen store. Avoid using glass or acrylic cutting boards. Wood and plastic boards are the best and will avoid dulling or damaging the knife. Do not place your knives in the dishwasher. The detergent can dull the knife and rust can form depending on the type of metal the knife is made out of. Always wash knives by hand and dry immediately. Brands that are worth checking out are knives by KitchenAid. They are not part of the elite group of chef’s choice of knives, but they do the job. If you are really passionate about cooking and don’t mind to spend the extra dollars Wüsthof Classic is my brand of choice for its stability, weight and sharpness. Selecting the right knife can be challenging, but whether it is for home or commercial use, choosing the proper knives are essential. Remember, three is all you need. This entry was written by TheRestaurantBlogger and posted on September 1, 2008 at 8:00 am and filed under Restaurant Ramblings. Bookmark the permalink. Follow any comments here with the RSS feed for this post. I saw an episode of No Reservations and Bourdain was with Morimoto in Japan. They went to this place where he gets his knives from and showed how it’s made. No wonder it’s expensive! Thanks for the tip about Kitchen Aid, the others are too expensive for me. I only own one $$$ knife and it’s my favorite. Restaurant Blogger, where do you like to store your knives? I haven’t found a block that I like, but having them clang around in a drawer doesn’t seem like a very good option. I didn’t even know Kitchen Aid has knives. I love my Wüsthof Classic chef’s knife, though. Can’t live without it. MoneyGrubbingLawyer, that’s a good question you raised. The one thing you should avoid is storing knives in between the tight space of your kitchen counter and your stove. I have seen too many people jam their knives in there. Not only can you seriously damage or dull the knives quickly, bacteria or other unknown things can be living in between those spaces. Where to store your knives is debatable. Some people suggest drawers while other do not. Depending on the size of your kitchen and width of drawer, you can purchase a fairly decent knife tray that will store almost all your knives. This is what I do and I found it works well but I still don’t have enough room. The knives that I don’t use so often, I store them away in my tool box which is only used for kitchen tools. Of course this will depend on the space you have. Then comes the knife block which are nice, but its hard to find the right one that will fit your knives. Lastly, you can store your knives in a knife roll which is a chef’s bag. However, for the everyday cook, I would just suggest storing it in the drawer within the tray. This allows it to be away from any kids and its safely stored away for easy access. I wish I could have seen the show that you mentioned. Sounds interesting. I do have two Japanese knives that cut amazing. Hi Joy, I only discovered KitchenAid knives about a year ago. My wife and I was tired of watching two of our sister-in-laws suffer using their cheap, dull knives. We found a great deal on a set of two Santoku knives by KitchenAid with red silicone handles for $50. One was a 7-inch and the other 4.5-inch. They work well for the everyday cook. Great article!! I always enjoy reading about kitchen cutlery and suggestions about buying or which knives to own. I enjoy using MAC myself, but feel it is always a good idea to mix and match brands based on personal comfortability. Regarding knife storage. I recently purchased a magnetic knife holder that you can mount to the wall. I mounted it right over the range. I like it, but was concerned about potential damage. Any thoughts? ?